The Labrador team, Lively Labs, won the Obreedience competition at Crufts 2018. The purpose of Obreedience is to encourage more breeds to ‘have a go’ at some of the tests associated with competitive obedience, but in a less formal competitive environment. Obreedience is a team event and showcases the talents of each breed through a series of fun exercises and it is perfect for all ages and abilities. 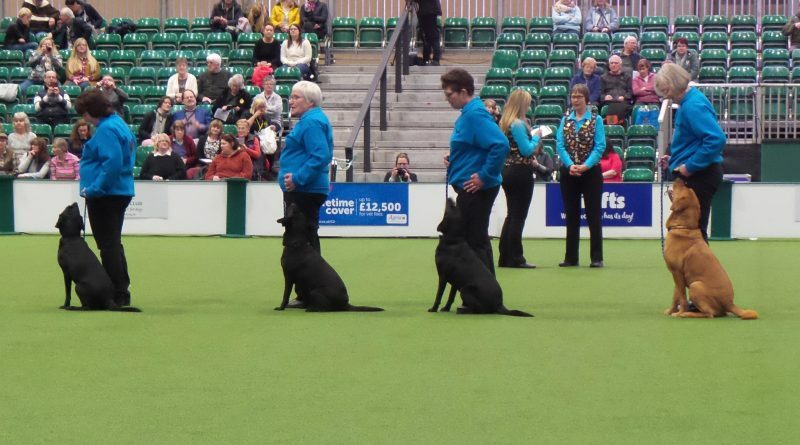 It mixes the best aspects of obedience with the camaraderie found amongst breed enthusiasts, each Obreedience team must comprise of four handlers and four dogs of the same breed who take part in two rounds of competition including a round of heelwork performed together as a group and then four set exercises including a retrieve, a ‘send to bed’, commanding the dog to stop, and a scent exercise. Qualifying heats were held throughout 2017, with the top 10 teams going through to the final, which was held at Crufts on Thursday (8th March). The Italian Job Lagotto Romagnolo team had to withdraw at the last minute, but one competitor still represented her team in the ring. Marney Wells was the judge; she has previously competed in the competition with her Staffordshire Bull Terrier. You can see a full gallery of pictures here. The Crufts YouTube channel also has a highlights video.